The sandy shore is not a hospitable place: nothing is stable and nothing grows there. All food on the sandy shore has to be imported, and is either washed in by the waves or blown in by the wind. The small pieces of shell and sand particles that make up the beach are always on the move, and are constantly washed by water and blown by wind. There is little protection for anything living there, so animals burrow into the sand or live between the grains of sand. Here they are protected from waves, sand movements and predators. No large plants grow on sandy shores but pieces of dead plants are washed in by the waves. Microscopic algae, called diatoms, are found in the water and between the sand particles. The many small animals living between the sand grains form an entire foodweb, including grazers, predators, scavengers and detritivores (animals eating tiny fragments of decaying food). Many animals use tidal, lunar or seasonal rhythms to help them survive. Thus plough snails burrow into the sand at mid-tide to avoid stranding on the high shore. Small, white sandhoppers and ghost crabs are both nocturnal scavengers. During the day the sandhoppers bury themselves in the damp sand of the high-tide mark and the ghost crabs retreat to deep burrows. By being active at night they avoid both predators and the hot, drying sun. Animals of the sandy shore are dependent on seawater to keep them moist, and to supply them with oxygen and food in the form of small pieces of dead plants and animals. 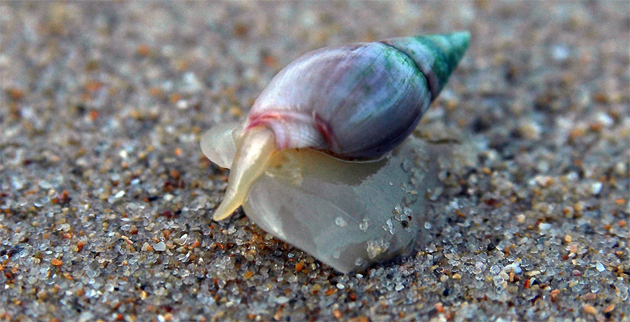 Like most sandy shore animals, the common plough snail is a scavenger. It is sensitive to traces of food in the water and uses its large foot as an underwater sail to surf up the beach in search of stranded prey. Many animals are filter feeders, such as the mole crab which lives in the intertidal zone on the east coast of South Africa. The long net like antennae are used to trap food from the water. Other filter feeders include white mussels, sand prawns and mysid shrimps. Zooplankton (small drifting animals) and fish are the animals found most commonly in the surf-zone. Zooplankton is a food source for filter feeding animals. Jellyfish and blue-bottles are not resident in the surf-zone but are washed in from the open sea. When stranded on the beach they are an important source of food for scavenging beach animals. Fish found in the surf-zone include soles, mullet, pompano, garrick, tasselfish, blacktail, elf, skates, rays and sandsharks. They feed on smaller fish, zooplankton, molluscs and crustaceans. Gulls, sandpipers and terns are some of the larger animals on sandy shores. Turtles nest on northern KwaZulu/Natal shores during summer. Pollution, bait harvesting, traffic and development harm sandy beaches. Pollution includes oil slicks, chemical effluent, sewage and litter (from ships at sea, rivers and beach users). Most large burrowing sand animals, e.g. 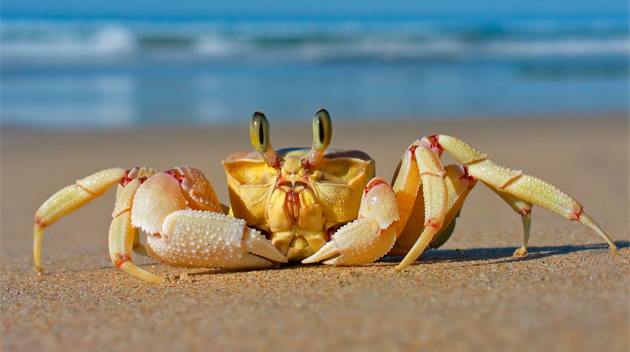 mole crabs, mussels and ghost crabs are used as food or bait. Vehicles on beaches kill beach creatures, compact the sand, destroy burrows and, at high tide, drivers trying to avoid the incoming tide damage the dunes. Popular bathing beaches may be so disturbed that no sign of animal or plant life remains. Development such as mining and building on beaches or in the dunes ruin sandy beaches. Dunes are vulnerable to trampling, vehicles, dumping of refuse, grazing, and littering. Many of these activities destroy the vegetation which stabilises the dune sand. Visit the beach after a storm and see what has been washed up. A trip to the beach at night with a torch will show you many creatures not normally seen. Avoid walking over dune vegetation, driving vehicles on the beach, making fires with coastal forest timber and littering. Develop and share your awareness and concern by making the sandy shore the topic for your next school or guide/scout project. HANDS ON THE EAST COAST SANDY SHORE: A FIELD GUIDE. A. Ashwell. 1991. Share-Net, P O Box 394, Howick, 3290. THE LIVING SHORES OF SOUTHERN AFRICA. G. Branch and M. Branch. Struik, Cape Town, 1981. THE BEACH CODE. Natal Parks Board. Tel. 0331-471961. A GUIDE TO THE COASTAL FISHING REGULATIONS OF NATAL. Natal Parks Board. It is in point of fact a great and helpful piece of info. I am happy that you shared this helpful info with us. Please stay us up to date like this. Thanks for sharing.